Honda’s HRC216PDU Push Mower is top of the line in their manual push mower range. At first glance it is apparent that this machine is built tough to withstand the punishment contractors subject their machines to. The steel deck has an efficient cutting width of 21” and replaceable wear strips on each side of the deck protect it from inevitable knocks. There is also added protection from the front bumper bar, which is a good lifting point and securing point for transportation. The blade set-up is different to most with Honda’s MicroCut® twin-blade system fitted. This consists of a single solid lower blade and a slightly smaller offset upper blade, which notably improve the mulching capabilities compared to other Honda’s I have used with single or swing back blades. Blade changes are obviously more expensive than usual although I think the quality of cut/mulching achieved outweighs the expense. Honda’s famous GSV160 engine is fitted and is proven for this application; known for its power, longevity, reliability, quietness and easy starting. The paper air filter with foam pre-filter is easily accessed in seconds without tools enabling quick-on-the-job inspection and cleanout if required. Personally, I’m not really a fan of the four-wheel height adjustment because a single handle adjustment is easier and quicker. A huge 88-litre mesh catcher is easy to install and remove with a solid lift handle, as is the mulch plug. As anticipated a neat, clean cut was achieved with the grass expelling well into the catcher and a better than I anticipated mulch cut was achieved with no cut grass residue left on the grass surface. 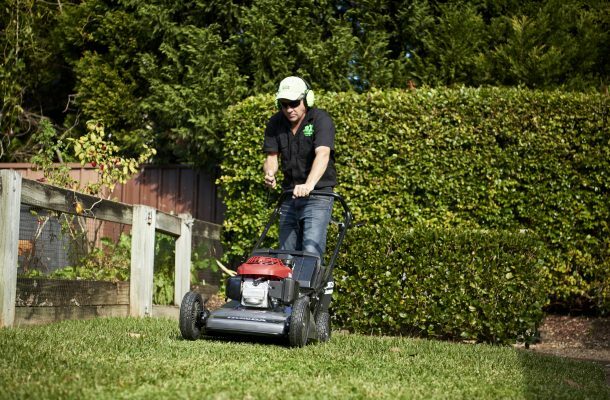 The MicroCut system chops grass finer than a traditional blade set-up so the catcher can hold up to 30 per cent more clippings, which means fewer stops to empty the catcher. Honda’s Mow-Safe® engine brake safety system is fitted to this unit, which stops the blades and engine within three seconds of the operator releasing grip on the handlebar. This means it is impossible to remove the catcher or mulch plug with the engine/blades in motion reducing any potential operator injury. The handlebar is one of the most robust I have seen, but it’s not foldable. However it is 1” in diameter, has sturdy attachment supports to the deck and reinforcing bars that ensure it is suitable for commercial punishment and long life. The unit is heavy, which means ramps would be required if loading onto a ute with one person, although it was still very easy to push with little effort for a big unit. The HRC216PDU is definitely a solid, well-performing unit constructed for the commercial environment and made to last. It is backed by a two-year commercial warranty.